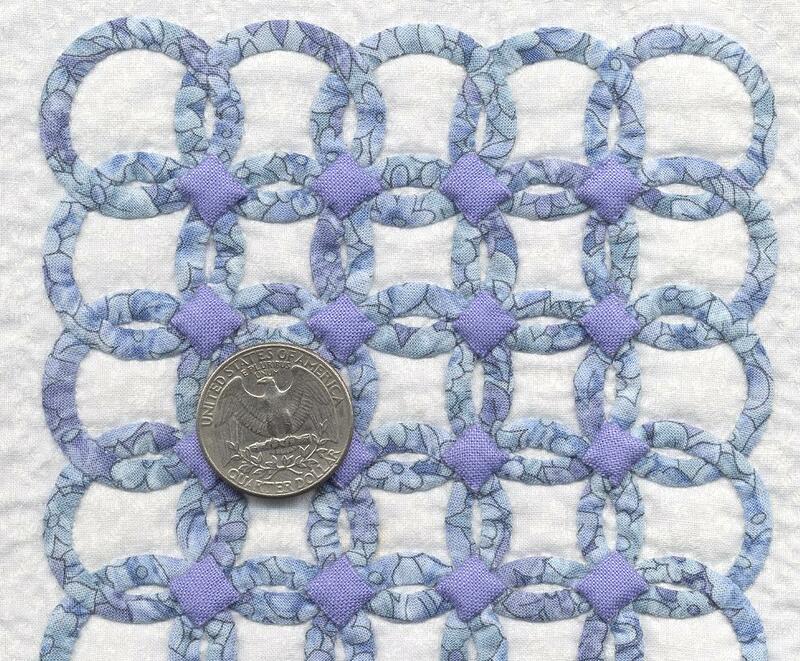 Alice Sundquist from Salt Lake City, UT is pretty good with a needle and thread. 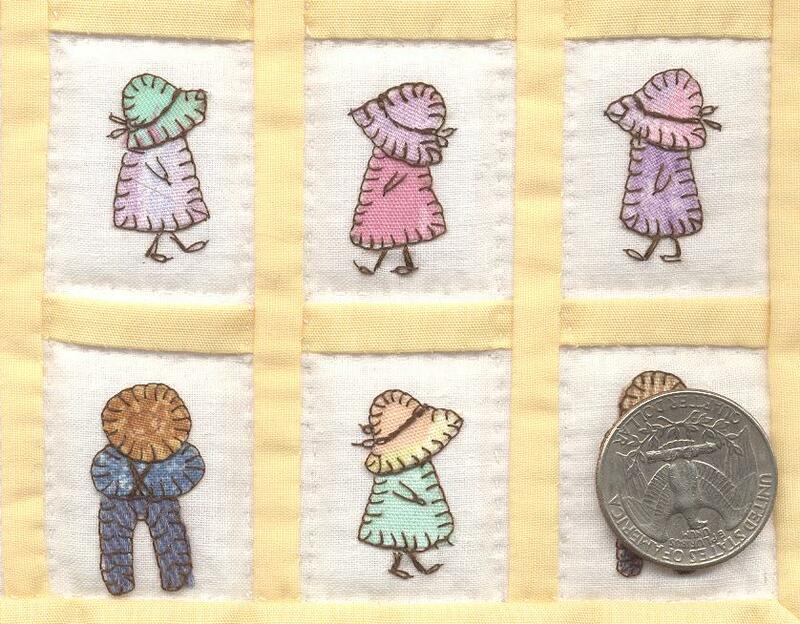 She made this miniature quit in 1994. I had the honor of holding it (all 8.5″ x 9.63″ of it) in my hands and admiring the incredible hand stitching. That blanket stitch was done with a single thread! I tried not to drool on the quilt. Alice, now 91, has donated this treasure to the Alzheimer’s Art Quilt Initiative and it is in the October quilt auction. If this doesn’t inspire you to make a bid, I don’t know what will. I picked another miniature, equally incredible, for the auction this month. It is the perfect work of Nansi Bainard, shown below. Her “Tiny Double Wedding Ring” certainly lives up to its name, measuring just 5.5″ x 7.13″. I got a headache trying to figure out how she did it. Amazing! People who see these quilts in person (after having washed their hands and cleaned their glasses) stare with their mouths open. It’s not often you see work of this caliber. How do the other quilts in this month’s auction stack up? As my mother would say, ‘there aren’t any flies on them either. ‘ Please go take a look and start hunting for the lost coinage between the sofa cushions. We need you to bid so that the Alzheimer’s Art Quilt Initiative can turn these quilts into research dollars. Do you want to join the fun? The Priority: Alzheimer’s Quilt project is on-going. We are accepting quilts of any theme, any technique, and any ability. I guarantee the quilt you make will touch someone’s heart. The time investment is small, as is the size: no larger than 9″ x 12″. For information on how to start, click here. The auction ends on Friday, October 10th at 10p EST. Tell somebody, even if you think they’ll outbid you. This is for a good cause. Raffle Quilt Supports AAQI	How About THAT?! I checked out the October auction. They are incredible! And so many have such touching dedications and artist statements it makes them more meaningful. How do I choose? Alice is so amazing! What tiny stitches. She is an inspiration. Beautiful quilts up on auction!!! I need to get another one done. You know I am a regular reader of your blog, and you have been tagged! Please visit this blog post to learn what to do.